Long ago Carrots were originally in colours ranging from purple to white, pale yellow, red, green and black, but never orange! 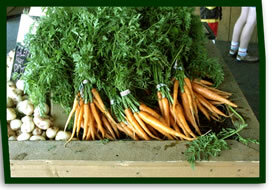 Orange carrots were developed by the Dutch in the 1600's. With the exception of beets, carrots contain more sugar than any other vegetable, which makes them a satisfying snack eaten raw and a tasty addition to cooked dishes. The longest carrot in recorded history (1996) was 16’10½” long! The heaviest known carrot (1998) was 18.99 pounds! Carrot roots should be firm, smooth, relatively straight and bright in color, and will keep in the refrigerator for about 2 weeks if stored in a perforated plastic bag or wrapped in a paper towel to reduce condensation. Keep them away from apples, pears, potatoes and other fruits and vegetables that produce ethylene gas which may cause the carrots to become bitter.